April 25, 2016 1:34 pm / 9 Comments on Take five. I wanted to post a quick notification that The Slightly Confused Woodworker blog will be going on a (hopefully brief) hiatus. Nothing nefarious to report. I’m expecting a very busy week or two both at work and at home. And maybe, just maybe, it will help to get rid of any bad blood. Not that there’s any bad blood; I’m just being dramatic. The good news, at least for me, is that I’ve actually gotten in a relatively large amount of woodworking time over the past few days. I built another “Sellers” box and prepped the material for two more (more on that in my next post), I’m most of the way through a Superior rip saw restoration, my daughter and I made a piece of doll sized furniture, and I got the material prepped and ready to go to build another spoke shave. So if everything goes well and things level off at work a little, I should have the blog up and running again by next week with several new posts, photos, and possibly a short video. So thanks to everybody who reads, comments (even if you are being critical) and puts up with my nonsense. I appreciate all of it. April 22, 2016 9:25 am / 19 Comments on Huh? I’m not a professional writer. I hate to keep reminding people of this fact. But I have to put it out there. However, I think I know a few of the rules of good writing. And I’ve always been under the impression that you shouldn’t really put out an explanation of satire. So I’m going to break that “rule” right here since there seems to be a lot of thin skin in the world of woodworking. Yesterday’s “Roubo items” post had nothing to do with insulting Andre Roubo or those who admire his work. I was on Ebay Tuesday afternoon (good song, btw) and saw “Andre Roubo T-Shirts” for sale. I thought it was pretty funny, and it reminded me of when I was a kid and the original Star Wars movie was released. It seemed that just about every item you could think of had a Star Wars logo plastered on it, from cereal to bath towels to plungers. So that’s it, nothing more. If you don’t believe me, check it out on Ebay. And thanks for effing up my joke. April 21, 2016 8:36 am / 17 Comments on Items for sale. The first item is a Roubo twig taken from a maple tree. Obviously normal twigs are virtually worthless, but because this is a Roubo twig the value increases dramatically. First $65 takes it. You can see this is no normal pencil. For those who may be unaware, this is a Roubo pencil. Highly prized. Cost $245. No apologies. Firstly, it’s easy to tell that this is Roubo shoe polish because it says it right on the front. The French writing also confirms it. Because it is brown, the same color as most tree bark, it is even more valuable than black or cordovan. Cost $305. Very rare! There were few if any electricians alive during the time of Roubo, so this may built have been used by the man himself! Clearly labeled ‘Roubo’ so you know it’s authentic. $1275.00 No apologies. I saved the best (and rarest) item for last. This is certainly one of a kind and likely used on Roubo’s personal television. Though not really useful in the woodworking sense, it is a one of a kind collector’s item. $12,265.00 and not a penny less. I’d like to add that I generally would never solicit readers of this blog, but I’m not doing this for my own profit. I am, at this moment, having an ideological paradigm shift, and I feel that sharing it with all of you is the first step in making it happen. I’m asking for your advice. April 19, 2016 3:41 pm / 32 Comments on I’m asking for your advice. Let’s just say that I’m a sucker for woodworking books, good, bad, or so-so. In general, I probably purchase 3 or 4 per year, blind in most cases (in the sense that I did not read any reviews etc.). I won’t call woodworking books expensive, though they generally cost more than your typical novel or history book, but I probably do spend somewhere in the neighborhood of $150 each and every year. So the other day the Highland Woodworking advertisement arrived in the mail and right on the front cover is the latest book from Lost Art Press: The Anarchists Design Book. The only thing I know about the book are some snippets I’ve read on the Popular Woodworking blog. It appears to focus on staked furniture, which in all honesty is a style that I don’t care for all that much, though I do prefer furniture that is simpler in design. And though I’m not really on-board with the whole “anarchist woodworker” ideology, that alone wouldn’t stop me from reading a book. So I’m about to do something I normally wouldn’t do and ask for an opinion of a woodworking book. If anybody out there who reads this blog has also read the Anarchist Design Book, would you mind giving me an honest, unbiased assessment of the book, likes, dislikes, etc. As I said earlier, in general I don’t have an issue when it comes to blindly purchasing a woodworking book, but I’m trying to be a bit more judicious with my woodworking fun money. And considering that I’ve had issues with “anarchy” in the past, I’d hate to spend money on a book knowing that I already may disagree with the subject. So, if you don’t mind lending me your opinion and a bit of your hard-earned time, I would appreciate it. So as far as excuses for not woodworking are concerned, I’ve had a good one. I mentioned in my last post that old guy Bill has been having some back problems lately-mainly muscle spasms, not that I’m happy admitting the truth, but that’s what it is. I did not go to see a doctor, though I probably should have. Instead I stuck to my standard remedy: a back brace, Aleve, and rest. Normally in these situations it is recommended to avoid heavy lifting, repetitive motion etc. and while I unfortunately cannot follow that advice while at work, I can at home, so that is exactly what I did. The fact that I was also preparing to participate in a charity run (another activity not recommended while having back issues) kept me from woodworking as much as I would like, and for once I didn’t mind. Although I was injured, and busy on top of it, that still didn’t keep me away from my workbench completely. The first thing I (we) did was begin the construction of my daughter’s doll furniture. A while back I had prepped most of the wood and yesterday started some of the assembly along with my kid. The only thing that kept us from completing the table was running out of material, so we went to Lowe’s to pick up the missing piece. Hopefully we’ll finish the table this week and I’ll post some photos. The other woodworking attempt did not go nearly as well. Last summer I purchased a beautiful coffin-style smooth plane. I went through the cleaning/flattening/restoration pretty much without a hitch, but as per usual with old tools the iron needed some work. When I received the tool the iron wasn’t mangled, but it was poorly ground (very likely with a grinding wheel) that left an uneven hollow and gave it a slight skew. When I initially sharpened the iron I did not completely remove that skew. A few weeks back I used the coffin smoother to clean my workbench top, and I noticed that it had become “toothy” in the area of the skew. I guessed that the steel there lost its temper (or something to that effect) and will no longer stay sharp. So to make a long story short, I spent a good hour first straightening, them cambering, then polishing the plane iron.
. So the moral of this story, in particular to new woodworkers or woodworkers new to purchasing vintage tools, is be wary. Inspect vintage tools if you can, in particular the iron. Check for poor grinding, really shiny spots on the bevel etc. Also check the flatness, because if an iron can’t be reasonably flattened it can also lead to issues such as this. The iron on my plane happens to be fixable, but it is going to take a lot more work. I quite honestly do not want to spend another two hours regrinding this tool, but in order for it to work correctly that is what needs to be done. I’ve been having bad back spasms lately (shoveling 5 cubic yards of wet mulch will do that to a middle aged guy), so I made no attempt to woodwork this past weekend. The good news is I was able to catch up on some blog reading as well as watching some woodworking videos. Considering that I’ve been making a fair share of dovetailed boxes lately, my reading and video watching was centered mainly around the dovetail joint. For this particular post I have no real desire to touch on the mechanics of the dovetail joint and how it is sawn. However, I briefly want to discuss one aspect of the joints appearance. For whatever reasons, I took to the dovetail joint fairly quickly. When I first began, it seemed that the hallmark of a really skilled dovetail joint was a very thin pin. So after I developed some consistency in sawing dovetails, I began sawing the joint with thin pins. At some point, however, I stopped. Why? I don’t really know the exact reasons. Because the dovetail joint is first and foremost structural, maybe larger pins, more on par with the tails, looks stronger to my eye. Or maybe it’s just the fact that I don’t really care for the look of thin pins on an aesthetic level. In fact, on most contrasting woods I think they look hideous. But there are some cases such as half blind dovetails in drawer construction where I think they look okay. Otherwise, I’m not a fan. So, the whole point of this little post is to see what the opinions are of woodworkers who may read this blog. How do you like your dovetail pins, thin, beefy, or somewhere in between? In most woodworking project videos that I’ve seen the thin pin is avoided like the plague. Is there a reason for this? Once again, I’m writing this post because I want to know what other woodworkers think, so if you care to let me know I would appreciate it. I can build a box. 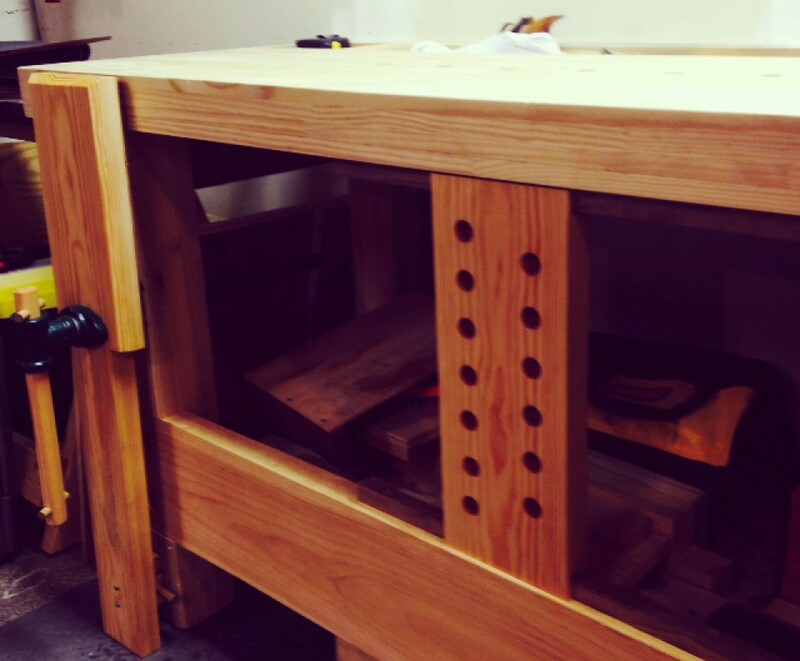 As a woodworker, you will probably understand that making a box is actually no mean feat. To a person who has never made a box before, it may seem like an easy task: six boards and some nails/screws and glue. But the reality is that a good box is a bit more complicated than that, though hardly what would be considered difficult. So the fact that I can make a box is neither something to praise or something to poo poo. As far as this particular box is concerned, this is my sixth attempt at this style, my third finished version, and the first with a lid. I’ve described the construction of these boxes in previous posts, so I won’t get too detailed in that regard here. But there are a few things worth noting. The first thing worth noting was the glue-up of the dovetails. If you saw your dovetails correctly, you should end up with a square box (square in the sense straight and true). My box was dead square upon the dry fit, but when I clamped it up to be glued it skewed a bit. I thought I corrected the problem with some adjustments, but it ended up slightly askew, approximately 1/32nd. That was not a big deal, but it could have been had I just assumed that the clamps would not affect the shape of the box. Most experience woodworkers and carpenters know to check for skewing. So if you happen to be a beginner, always check your box both before and after you clamp it. Another thing worth noting are the construction methods. I decided to use all hand tools for this project. I’ve mentioned before that I am not an advocate of any one method over another. I generally use hand tools because I have little room for anything else, and I do happen to enjoy it. That being said, I will likely build several more of these boxes over the next few weeks, and I will likely use the table saw for at least prepping the stock, and perhaps more. For example, I had the dovetails sawn and fitted for this box in around thirty minutes, which is not great, but not bad either. It then took me nearly an hour to set up the clamping and get the two grooves plowed for the sliding lid. Those grooves turned out nicely, and the tools I used (both router plane and plow plane-I was experimenting) did a fine job, but the clamping set up was another matter. Using a plow plane or a router plane on narrow boards is not easy because the boards are difficult to clamp down without the clamping apparatus getting in the way. Of course there are all the usual methods, which I did use, but those methods do not work as smoothly as they would seem to, at least not for me. I could have had those grooves plowed out using the table saw in less than 5 minutes. The same can be said for the sliding lid. I used the moving fillister plane to “raise” the panel. The plane itself did a fine job fairly quickly, but the clamping set up fought me every step of the way. This does not mean that I’m giving up on using the plow plane for groove making, but it does mean that sometimes the most efficient tool for the job should be used. In this case, because of the dimensions of the board, the table saw was the quickest and most accurate solution. While I enjoy using hand tools, I don’t necessarily enjoy making a lot of jigs, and the clamping set-ups I’ve seen for plowing narrow boards are all what I like to consider “contraptions”, and I’ve yet to come across something either in print or on video that demonstrates a simple solution to this problem, which seems minor but is actually very real. In any event, this box is finished. During the next few weeks I will likely make a few more. I have enough material left to make at least two, and I would like to “perfect” the process before I move on to another piece of furniture. Of course, there is a lot more furniture I would like to build, but right now boxes will have to do. I do enjoy making them, and considering that they are the only thing I am allowed to make for the time being, I had better stick to it.